If you have decided to upgrade your vehicle with a bull bar, this article will come in handy as we will walk you step by step through the bull bar installation process. 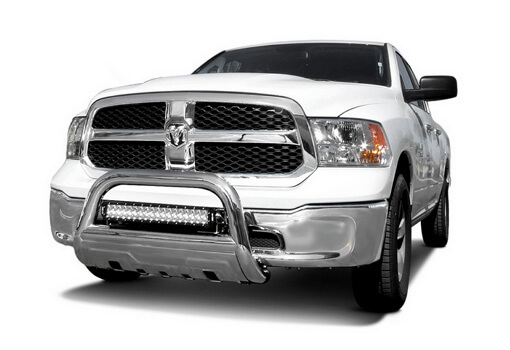 A bull bar is a stylish accessory that is meant to endow your vehicle with a muscular and mighty appearance. However, apart from aesthetic features, this product toughens up your vehicle, giving extra protection for its front part. Nowadays, the automotive market offers a wide range of these accessories, including bull bars, grille guards, push bars, all featuring only slight differences in the construction, but still fulfilling the same purpose. The bull bar, grille guard, or push bar installation is quite simple requiring no special equipment, so it will hardly take you half an hour. Well, you’ll see it for yourself. 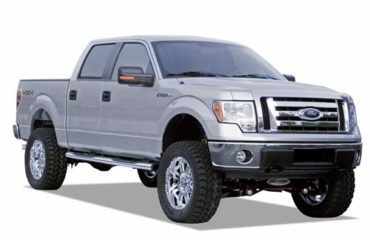 Unpack the bull bar and mounting hardware and prepare it for installation. 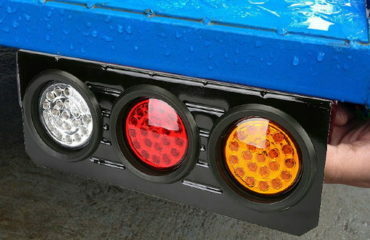 Locate the mounting holes under the front end of your truck or SUV. Note, that some American-built trucks and SUVs come with pre-installed tow hooks from the factory. These tow hooks are mounted using the holes you will need to install your bull bar. So if that is something you’ve got, you will need to remove the toe hooks prior to bull bar installation. Attach the lower mounting brackets to the holes and leave the bolts loose enough to allow further adjustments. In cases when the vehicle does not feature pre-drilled holes for the bull bar installation, you will need to drill them on your own. Line up the mounting holes on the bull bar with the holes you’ve got in the mounting brackets. Bolt the bull bar to the brackets. Line up the bull bar and make sure it’s positioned right. Some states require relocating the license plate on the bull bar or grille guard, so check your state regulations to make sure you need to do this. 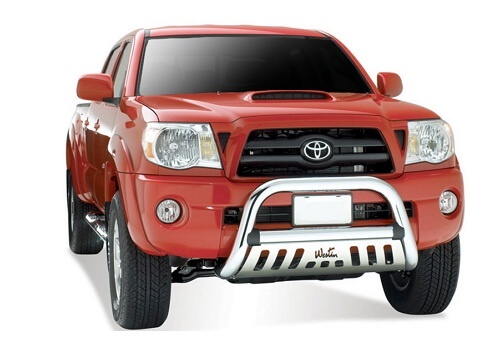 Such type of accessory as a bull bar usually requires just lower brackets, but for a larger construction such as a full-width grille guard, you might also need upper brackets. 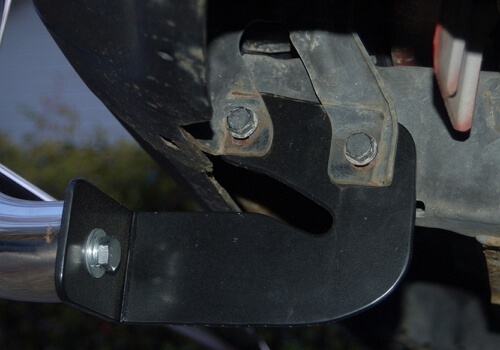 Your truck or SUV has mounting holes in the front for the installation of various accessories like winches, tow hooks, snow plows, and, of course, bull bars. If these pre-drilled factory holes are already used by tow hooks, you will need to unbolt and remove them. Depending on the design of your vehicle, lower brackets might be mounted differently, so we highly recommend you to carefully read the “how to install a bull bar” instructions for your specific make and model. 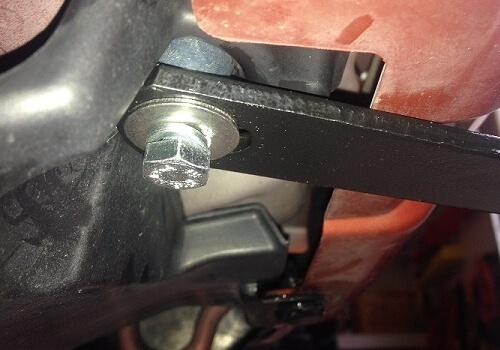 Attach bolts and leave the brackets slightly loose to allow for some further adjustments. Once the mounting brackets are in place, the bull bar is ready to be secured onto them. Just line up the holes on the bull bar and holes in the brackets and bolt them together. When everything is finally centered to your liking, go ahead and tighten up the bolts and nuts, implementing the last required step. This might be necessary if you have brackets designed to pass through holes, however, your bumper or bumper cover doesn’t have any. First, you have to determine the spots where the holes will be drilled. For this purpose, ask your friend to hold the bull bar over the center of the bumper and mark the spots where the lower brackets have to be attached. Then, use a compact portable saw or a die grinder to cut small holes in the bumper. Some bull bars might block the front license plate on your vehicle. 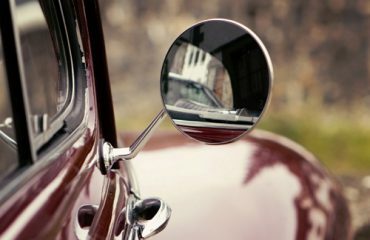 In this case, you might need to get specially-designed license plate relocator brackets not to break the law of keeping the front license plate visible. This relocator is usually placed on your factory plastic license place holder or instead of it. As you see, the bull bar installation is indeed a very easy process, requiring not much effort yet bringing highly pleasing result. We are sure that the bull bar installed on your truck or SUV will make your vehicle stand out from the crowd and draw admiring glances on the road. Thanks for the instruction, will try installing my bull bar by myself. Seems like that's something I can do, does not sound too complicated, just bolt-on... WIll save $300 instead of paying my local body shop haha. Cheers, Steve. I've got it in black and it's holding up really well, even the salty winters didn't make the powder coating peel off. Don't forget to get a license plate relocating brackets, because the bullbar actually covers the license plate.